“Black and blue” is something that denotes pain. 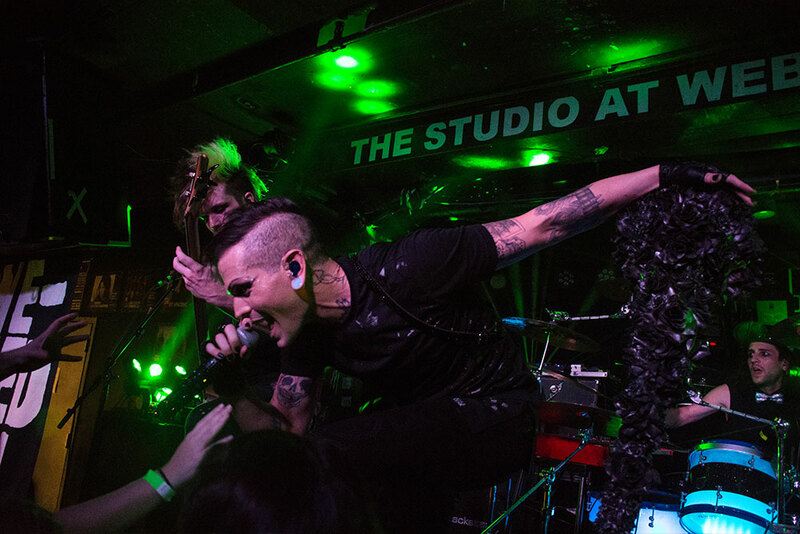 Echo Black, a New York-based pop/rock band, is known for its intense performances. The band plays shows that leave audiences physically and emotionally drained – pleasurably. “We named the tour this as a tribute to the 34th anniversary of Spinal Tap,” said Blu, during a phone interview Wednesday from a tour stop in Asbury Park, New Jersey. The line came from the film “This Is Spinal Tap,” where guitarist Nigel Tufnel proudly demonstrates an amplifier with a volume knob marked from 0-11 instead of the usual 0-10. Echo Black, which hit the area last fall for shows at the Barbary and Bar XIII, is returning to Philly on May 3 for a show at the Voltage Lounge (421 North Seventh Street, Philadelphia, 215- 964-9602,www.voltagelounge.com). Last year, the band met and exceeded its goal on Indiegogo to fund its debut album “Dawn,” which was released in October. Echo Black features Danny Blu (vocalist), Billy Long (drums, keyboards), Felix Skiver (guitar, vocals) and Rob Gnarly (bass, vocals). “Felix is our permanent guitarist, but he was unable to come out right now for these shows,” said Blu. “So, we’ve added a touring guitarist – Alex Adamovich. “We haven’t been in the studio to write or record lately. We’re still focusing on touring in support of the album. We had three singles out and then the single ‘Dawn’ was the lead for the album. We had been waiting to put an album out since we started the band in 2015. “We’re proud of the album. It’s a good representation of the band. We put so much time and effort into it. Makeup tutorials might sound strange perks for a band’s funding perks but not that strange if you take into account that Echo Black is billed as a “queer pop/rock band.” All of Echo Black’s makeup is sponsored by MAC Cosmetics. “I think it’s funny that we get described that way,” said Blu. “We just make poppy rock music and I happen to be gay. The other three aren’t. “I grew up in Morris County in North Jersey and have been in New York City since I graduated high school in 2008. I moved to Queens with my sister. I went to New York to be an actor. Echo Black is comprised of members whose musical inspirations range from basement punk to Frank Sinatra, and everything in between. “We’re all from different musical backgrounds,” said Blu. “Now, we all come together to make the dark sound we make. “We recorded ‘Dawn’ early in 2017. We were in the studio over the course of a month. Some of it was recorded in Seattle and some in Paterson, New Jersey. Then, we had to rush to finish it because we were going on tour with Psyclon Nine. Video link for Echo Black — https://youtu.be/Hy9-mYGqjTg. The show at the Voltage Lounge, which also features City of the Weak and In Loving Memory, will start at 5:30 p.m. Tickets are $13. Other upcoming shows at the Voltage Lounge are That Big 80s Party on May 4, King Lil G on May 5, Luicidal on May 6 and Smooky Largielaa on May 8. For almost three decades now, Michael Glabicki has been travelling across the state – from Pittsburgh to Philadelphia – to bring his band Rusted Root to play shows in this area. 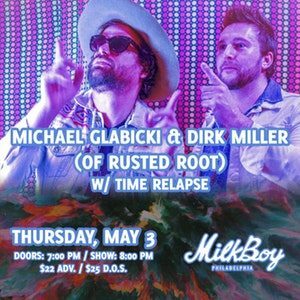 Glabicki is coming again this week to perform a show on May 3 at MilkBoy Philadelphia (1100 Chestnut Street, Philadelphia, 215- 925-6455, www.milkboyphilly.com). But, there will be a difference this time. The show at MilkBoy will be with his new project – Uprooted. Now, Glabicki is exploring new sounds and opening new doors with his solo career. 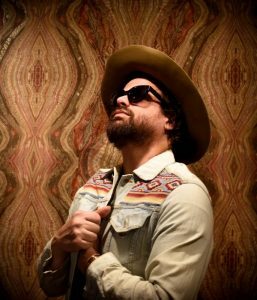 He has started touring nationally as a duo with Rusted Root’s guitar player, Dirk Miller, and explains that although he has his roots with Rusted Root, this show is very different. 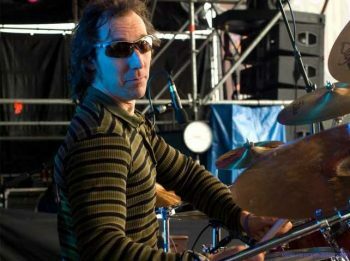 Live, both Glabicki and Miller play acoustic and electric and Glabicki often adds rhythm with a kick drum – creating a much fuller sound and energy than you find with a traditional duo. “With Uprooted, I wanted to make it a little more cinematic – and more blues-oriented,” said Glabicki. “I wanted tighter grooves and more impact for vocals as a collective. “I started the project about three months ago. It’s modeled after Afro-Beat where guitar and drums all fit together and give space to others to be part of that rhythm. Now, for the time being, Rusted Root has been placed in a state of suspended animation. Glabicki is keeping his perpetual motion going with Uprooted. Video link for Uprooted – https://youtu.be/pQWxfzsR5Io. The show at MilkBoy, which has Time Lapse as the opener, will start at 8 p.m. Tickets are $25. Other upcoming shows at MilkBoy are Triple Goddess on May 4, Clay Cook on May 5, The Mother Hips on May 6 and Taylor Phelan on May 9. MilkBoy was one of the clubs Becca Mancari played late last year when she just released her debut album “Good Woman” via Gold Tooth Records. She also played a show at the World Café Live. Now, Mancari is coming back to Philly for a show on May 4 at Underground Arts (1200 Callowhill Street, Philadelphia, http://undergroundarts.org). 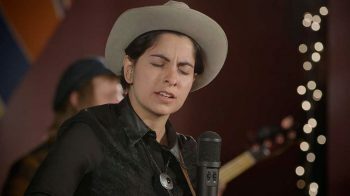 Listeners immediately know that there is something special about “Good Woman” – right from the opening track “Arizona Fire.” A unique, almost-industrial intro leads into Mancari’s sinewy vocals and then atmospheric steel guitar by Blake Reams supplements the hazy-but-still-country sound. The show at Underground Arts, which also features The Weeks, will start at 9 p.m. Tickets are $16. Other upcoming shows at the venue are Todd Barry on May 5, and The Melvins on May 10. “Whose Line Is It Anyway?” is an American improvisational comedy show which was an official adaptation of the British show of the same name. 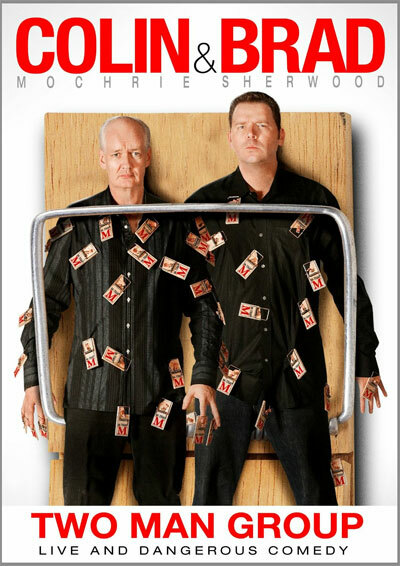 Two of the driving forces in the show are Colin Mochrie and Brad Sherwood. The first two episodes of the new season are scheduled to air June 4, 2018. On May 4, Colin Mochrie and Brad Sherwood will bring their “Scared Scriptless Tour” to the Parx Casino’s Xcite Center. This exciting event brings two of the funniest talents from “Whose Line Is It Anyway?” to the stage once again to play off of each other with their hilarious hijinks on the stage! Though both have worked in other respective works like “She’s The Mayor” and “The Big Moment,” they’re best known for their work in the improvisational world, using their quick-thinking abilities to create hilarious scenarios. One thing for sure – when the two zany characters get together, you can expect the unexpected. “We’ve been touring together for 15 going on 16 years,” said Sherwood, during a recent phone interview from his home in Las Vegas. “Colin is the most easy-going guy you’ll ever meet. We’ve never had a disagreement. “We’ve been doing this on stage for a long time. The saving grace is that it’s never the same show. All the travel is the only thing that is marginally unpleasant. “We’ve done shows when we’re crazy sick or exhausted but the minute we hit the stage, it all goes away. The adremnalin kicks in. We’ve been doing it so long we kick into super power mode. “We’re totally improv. There are no plot point nuggets. That would take the fun out of it. We don’t ever want to go to a well-worn groove. You can’t phone in an improv show. Every show is fresh. Every show is different. “It’s a two-hour show with an intermission,” said Sherwood. “We give them a full night. Most stand-up comedians only do a 60-minute show. We have a lot more energy than that. One thing is constant with their shows. Video link for Colin Mochrie and Brad Sherwood – https://youtu.be/315XcuPAZU0. The show at the Parx Casino will start at 8 p.m. Tickets are $35, $45 and $55. Kennett Flash (102 Sycamore Alley, Kennett Square, 484-732-8295, http://www.kennettflash.org) will present Kofi Baker’s Psychedelic Trip – A Tribute to Cream on May 3, A Night With The Kid – The Music of Michael Davis on May 4, Raymond the Amish Comic on May 5, and Mutlu on May 6. The Steel City Coffee House (203 Bridge Street, Phoenixville, 610-933-4043, www.steelcitycoffeehouse.com) will host Pat McGee on may 4 and 5. The Ardmore Music Hall (23 East Lancaster Avenue, Ardmore, 610-649-8389, www.ardmoremusic.com) will present Robert Randolph & The Family Band and New Sound Brass Band on May 3, Badfish, a Tribute to Sublime on May 4, Hezekiah Jones and Chestnut Grove on May 5, Bob Schneider on May 6 and The New Mastersounds on May 9. Burlap & Bean Coffeehouse (204 South Newtown Street Road, Newtown Square, 484-427-4547, www.burlapandbean.com) will present Man About a Horse on May 5. The Keswick Theater (291 N. Keswick Avenue, Glenside, 215-572-7650, www.keswicktheatre.com) presents “Abba the Concert” on May 5, “Late Night Catechism Las Vegas” on May 6, Garrison Keillor on May 7 and Eric Burdon & the Animals on May 9. The Sellersville Theater (24 West Temple Avenue, Sellersville, 215-257-5808, www.st94.com) has Canned Heat on May 3, Cash Is King on May 4, Vince Martell Band (Of Vanilla Fudge) on May 5, Robben Ford on May 6 and The Go Rounds on May 9. The Queen (500 North Market Street, Wilmington, 202-730-3331, www.thequeenwilmington.com) will hoist Hatebreed on May 3, Ani DiFranco on May 8 and Rival Sons on May 9.